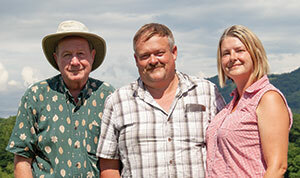 Tim and Jamie Kelley implemented their rotational grazing system in the 1990s. “We’re still learning,” Tim said. Kelley and his wife, Jamie, raise cattle, sheep, and goats in western North Carolina’s Blue Ridge Mountains near Clyde. The scenery is jaw dropping and land is a valuable commodity. Would-be buyers, mostly retirees, shell out $30,000 to $40,000 per acre to build homes in these mountains. The Kelleys have little in common with the mountains’ modern-day homesteaders, and they certainly are not in retirement mode despite having three grown children and five grandchildren. The family of this third generation livestock producer has been on the current farm since 1964. At that time, the primary enterprises were tobacco, molasses, and cattle. Kelley took command of the farm from his parents in the early 1980s, after getting married and graduating from Western Carolina University. Though the Blue Ridge mountain range is expansive, its farms are not. Like Kelley’s Chestnut Hill Farm, most livestock operations are tucked away in small valleys or on rolling hills. Many of the mountain’s livestock producers also have off-farm jobs, as does Kelley. The Kelleys participate in North Carolina State’s Amazing Grazing Program; they currently own 150 acres while renting another 100 acres. About 40 percent of the acreage is wooded. The pastureland base is divided up into 25 paddocks and can be further divided using polywire. They graze 30 mother cows, 35 ewes, and 17 goats. Kelley has found sheep and goats to be good “clean up” animals; they also add profit. The perennial pastures consist of both novel and toxic tall fescue along with orchardgrass. Both red and white clovers are frost seeded to maintain an adequate legume component. This helps from a nutritional standpoint and reduces the need for added nitrogen. The journey to a successful rotationally-grazed farm takes time, and it’s generally wrought with both successes and failures. “We need to be willing to try new techniques and technologies,” Kelley affirmed. “Over the years, I’ve learned that you have to observe and learn from your mistakes. You have to adjust and try again,” he added. 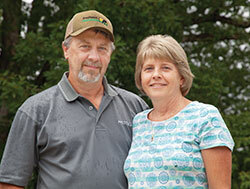 For the Kelleys, the journey began in the 1990s when he started rotational grazing his cattle. Working with federal and state government agencies, cattle were fenced out of the streams and waterways to improve water quality. It also had the unexpected outcome of improving cow and calf health. “Once we got the cows out of the mud and manure, their udders were cleaner and it virtually eliminated calf scours, which was causing us some calf death loss,” Kelley explained. With the help of government cost-share programs, the Kelleys had a new well dug on their farm and installed permanent water tanks along with several quick-connect couplers. This now ensures an adequate, clean water supply at all times and allows for access at different locations. It was about eight years ago that Kelley took his rotational grazing program to a higher level. With assistance from the Natural Resource Conservation Service (NRCS), he developed a forage plan that would have his cows grazing 300 days out of the year. Strip grazing is one of the many ways that the Kelleys accomplish a high level of forage utilization. He began to fall stockpile and strip graze about 30 acres of forage; this aided in dropping his feed input costs by 40 to 50 percent. Last year, the stockpiled forage was tested in late January after several hard killing freezes. It was still 16 percent crude protein and 69 percent total digestible nutrients (TDN). Cattle generally stay on pasture through mid-February and maintain excellent body condition. Kelley grows a small amount of corn that he harvests as silage. This, along with hay that he bales, is fed during the two months of nongrazing. The Blue Ridge livestock producer also dedicates acreage for the production of summer and winter annuals. These help fill the gaps when his perennial pastures go dormant in the summer or are just coming out of winter dormancy during early spring. Sheep and goats compliment Tim Kelley’s beef herd and help to maximize returns on his grazing acres. Kelley’s winter annual of choice is Ray’s Crazy Fall Mix, which consists of winter peas, winter oats, wheat, hairy vetch, crimson clover, ryegrass, Daikon radish, and turnips. The sheep and goats graze this mix throughout the winter; then Kelly applies 50 units per acre of nitrogen in the spring and begins grazing cattle on the mixture in late April. Once the winter annuals run their course, they are terminated and either corn or a summer annual is planted. Kelley uses pearl millet, sorghum-sudangrass, and Ray’s Crazy Summer Mix. The latter is a combination of cowpeas, sorghum-sudangrass, radish, sunflowers, pearl millet, and brassicas. Through trial and error, Kelley has become adept at matching his available forage to livestock needs. The cows are bred in late December through February to calve the following October and November. During the breeding season, cows strip-graze the stockpiled forage when the fescue toxicity risk is low. Conception rates on the farm are around 95 percent. Calves are weaned during the summer and then preconditioned for 60 days on novel-endophyte fescue and the summer annuals. A small amount of grain is also fed. Over the past seven years, weaning weights have improved from 500 to 600 pounds and sale weights have jumped from 650 to over 750 pounds per animal. How do the sheep and goats fit into the picture? “We breed them in October to lamb and kid in March,” Kelley said. “We pretty much graze them year-round. When the lambs are born, they grow fast in early spring on high-quality forage, and then we sell them in June at around 60 to 75 pounds. I want them out of here before the cool-season perennial pastures start to go dormant. In most years, the lambs make us more profit per acre than the calves,” he explained. Kelley can’t say enough good things about how management-intensive grazing has transformed his farm. “The best thing is that the ecosystem we’ve built now holds more of the moisture that falls,” he noted. “Droughts are always tough to get through, but our farm is a lot more bulletproof than it used to be. Though we may have to wean calves earlier in extremely dry years, we no longer have to sell cows,” he added. “We want the cattle to eat everything,” said Josh Sorrells. From the left is Steve Sorrells, Josh, and his wife, Tracey. Over and down a few hills from Kelley’s farm is another 57-acre beef operation owned by Josh and Tracey Sorrells. The husband-wife team purchased the acreage near Canton, N.C., in 2016 after previously leasing it for six years. Josh’s father, Steve, is also actively involved with the operation. Both Steve and Josh have horticultural degrees from North Carolina State University. Along with Tracey and Steve’s wife, Phyllis, they own and operate a successful nursery and landscape business, which is located near the family’s long-time home farm a few miles away from Josh’s new grazing operation. “We always had cows, but they would run in the mountains,” Steve said. “We never really needed a fitness center since we got more than enough exercise walking those fences on the mountains,” he chuckled. The recently purchased farm is far better suited for rotational grazing than a wooded mountain. Like the Kelleys, the Sorrellses have been working with North Carolina State Extension and Livestock Agent Henderson to develop a successful grazing plan. “It’s been a big learning curve,” Josh noted. Although there is still much to absorb and accomplish, it is evident that this clan pays attention to details and is set on maximizing production on their limited acres. For example, their dry round bales of hay are stored outside on wood pallets, butted end to end, to minimize storage losses. Another stack of bales were covered with a tarp. Sorrellses have fenced the farm to create multiple 5- to 7-acre paddocks; they move their cattle every five to seven days, depending on the weather. Polywire is used to strip graze and high-tensile wire comprises their perimeter fence. Thirty-four mother cows currently graze the pastures and are bred to calve in December. When calves reach 1,200 to 1,400 pounds, they are processed and direct marketed as grass-fed beef. It takes about 24 months to finish their calves. Presently, they are trying to build herd numbers, so all heifers are being kept for breeding. 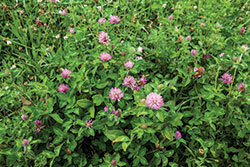 Sorrellses routinely frost seed red and white clover into their pastures. The results are evident. As for summer forage alternatives to tall fescue, Sorrellses were involved in a grazing trial with Henderson this past summer that looked at the potential advantage of using brown midrib (BMR) pearl millet. A mixture of sunn hemp, cow peas, and non-BMR pearl millet is being compared to the same mixture with BMR pearl millet. Sorrellses also plant some sorghum-sudangrass, which is made into baleage. The summer annuals are planted with a Haybuster no-till drill. The farm’s elevation of 2,200 feet keeps temperatures somewhat moderate. This is advantageous for forage quality, especially in the summer. Sorrellses like to feed first-cut grass hay along with their pasture forage. This lowers the risk of bloat and adds effective fiber to the ration. “The manure isn’t quite so loose,” Josh added. Some paddocks get stockpiled for winter feeding. In addition, a bale unroller is used to feed hay during the winter. “We like it better than ring feeding,” Steve said. “We can move the location and spread manure nutrients a little better. There also seems to be less waste,” he added. Sorrellses own a modest line of hay equipment. They rent an in-line bale wrapper from a neighboring farmer that they use to make baleage from their sorghum-sudangrass and wheat. Sorrellses will continue to learn and make improvements. This year, they plan to use available cost-share dollars to dig a well and install seven permanent ball waterers to service their paddocks. Cattle have already been fenced away from surface water sources. 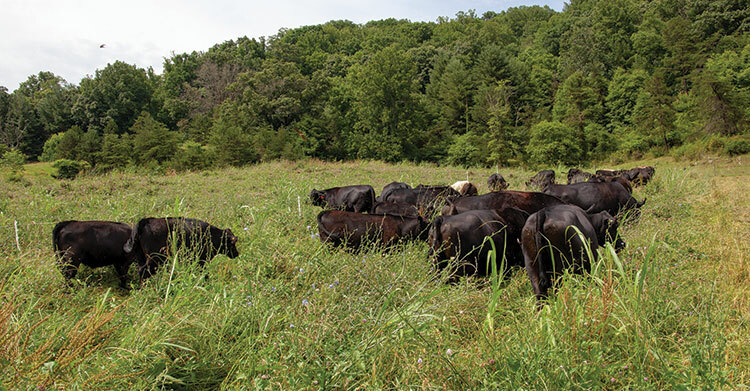 The cattle operations in the Blue Ridge Mountains aren’t large, but there are significant portions of land that are well suited for growing forage and livestock. Collectively, this acreage can and does contribute to economic growth for the region. The limiting factor is land availability, making animal and forage production per acre an important metric to maximize. How many of the region’s cattle producers will buy into the concept of intensive grazing is difficult to predict. 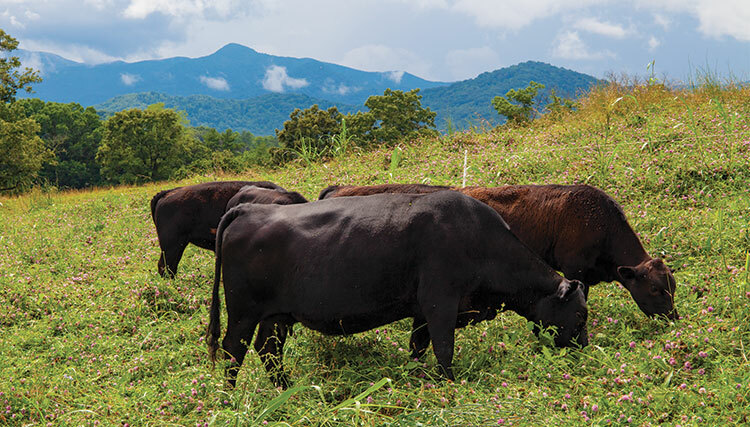 One thing is for certain: Few livestock producers in the U.S. can glance up from their written grazing plans and witness the level of eye-catching scenery offered in the Blue Ridge Mountains. This article appeared in the February 2019 issue of Grower on pages 6 to 8.